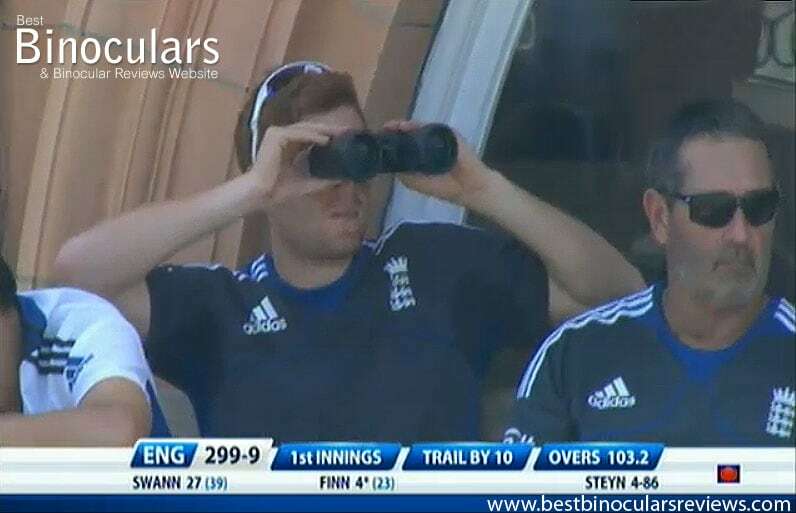 Eng vs SA - Who in the England Dressing room is using Binoculars to watch the cricket? Know the answer? Please comment below. It does not matter if you are watching a test match between the old rivals, England and Australia, a limited overs one day international, county cricket game, a Twenty20 slog-fest or even just the local club game on the village green, a good pair of binoculars really will add to your enjoyment of the game and I highly recommend taking a pair with you. When I lived in Zimbabwe and in the UK, I watched and even played quite a bit of cricket and would almost always take my binoculars with me. I find that I don't watch cricket with binoculars over really long periods of time as you tend to miss out on the overall experience of being at the ground, but they are ideal for getting a closer look at the batsman or bowler for a few balls at a time. In between overs, binoculars are also perfect for taking a look at which fielders are in the slips, who is way down at fine leg or even checking out the scoreboard at the other side of the ground. Binoculars are also great for crowd watching in between overs, during innings breaks, or when the play has been stopped for rain or bad light. However I am not suggesting that you have to spend a fortune on your optics either. Whilst it is true that the very best binoculars are also quite often some of the most expensive, there are also some really very good pairs of out there these days that won't cost you much more than a single ticket to a test match, yet you can use them for many years to come, safe in the knowledge that the view you get through them is of a very high quality. To give you an idea, take a look at some of the Best Value For Money Binoculars that I have reviewed in different price categories, or take a look at my winner for the overall Best Value For Money Binocular Award. Without taking the time to consider all the pros and cons, I think most people will come to the conclusion that you need a really compact, lightweight pair making them very easy to carry to the game, which may indeed be the case for some people. But compacts do have their drawbacks and just maybe a mid or even full sized pair will actually be a better option for your cricket binoculars. Because of their larger objective lenses, full sized and even mid-sized binoculars are able to take in more light, meaning that the image that you view through them is sometimes brighter and usually of a better quality - Note: other factors like the size of your pupil in the current light conditions, lens coatings and quality of the lenses and prisms will also have a big baring on this. On a bright sunny day, image brightness should not be a problem even with compacts and is only really and important factor in poor light conditions. So as almost all cricket is played in good light conditions (or they will come off for bad light), this will not really be that much of a limiting factor. It may be still something to consider if you are going to watch a lot of Day/Night matches or if you also want to use your binoculars for other uses like birdwatching where bad light performance is much more important. For more on this please see my Complete Guide to the Exit Pupil and this article comparing 8x42 vs 8.5x45 Binoculars that go into detail explaining how the objective lens size affects image brightness and quality. At the same magnification full size binoculars tend to have a wider field of view (see FOV below). As long as they are well balanced a larger heavier pair of optics will resist moving better, so are often easier to hold steady, which can be a consideration if you are using a higher magnifications. They are also far easier to use and more comfortable to hold than tiny compact binoculars, especially true if you are using thick gloves in winter ... which will hopefully not be an issue when watching cricket! If you do decide to go for a full sized binocular, it does however make sense to choose a pair that is small and lightweight when compared to others in their size class as some of the smallest, lightest ones really don't feel that much bigger than many mid-sized binoculars and yet you get all the benefits of having much larger objective lenses. The first problem with increasing the magnification is the higher the magnification, the smaller your field of view (FOV) will usually be (see field of view below). This means that a binocular with a high magnification and small FOV will enable you to see loads of detail, but less of the whole picture and so very high powerd binoculars with really narrow fields of view could mean that you could miss out on some of the action. The next problem with high powered binoculars is that it becomes harder and harder to keep the image steady as any movement you make becomes progressively magnified through the binoculars. High powered optics have a shallower depth of view, meaning that you will need to focus more often when looking at objects at different distances away from each other. So you have to make a compromise between getting close enough to the action to really see what is going on in great detail, but not so close that it makes actually means you are missing out on the whole story! 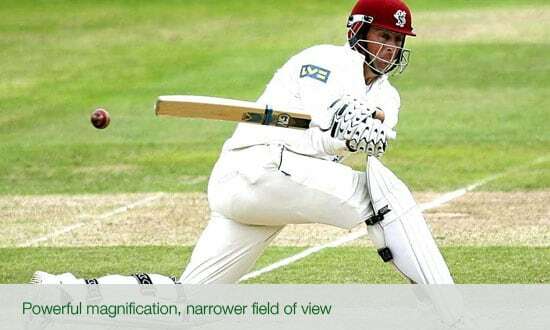 Obviously how far away you are from what you want to look at will also play an important part in choosing the right magnification, but in my experience magnifications of about 8x to 10x is about right for most cricket grounds. The field of view (FOV) of a pair of binoculars is basically the width of the image that you can see through the binoculars. For activities like bird watching, where you are observing small erratic and fast moving objects, a wide FOV is very important as it helps you to quickly locate the bird as you have more chance of it instantly being in your view. For cricket where the "objects" you are looking at are large, relatively slow mammals dressed in white making them stand out, the FOV is really not that critical. But having said that, a wider field of view does have the advantage in that it enables you to catch as much of the action all at once without having to move the binoculars about, so ideally you'll want is a pair of binoculars with a reasonably wide FOV within your chosen magnification. Remember: In most cases the more powerful the magnification, the smaller your field of view will be. A binoculars FOV is usually expressed in feet at a distance of 1,000 yards, but increasingly common is in meters at 1,000 meters or it is sometimes described as an angle. I would say that a FOV of around 315ft at 1,000 yards (105m at 1,000 meters / 6.0° ) is fine, but in general the wider the better (as long as the image remains sharp right to the edges), so if you are undecided between two models, check which has the widest FOV as this may help you to make your decision. Roof Prism Disadvantages: A cheap roof prism is usually optically inferior to a cheap porro prism's. This is because it is harder to align roof prisms and to ensure total internal reflection the roof prism design also requires expensive coatings which are obviously not used in cheaper models of roof prim binoculars. This is not a problem in the mid to expensive range, so if you are planning on buying a very cheap pair of binoculars (which I would strongly advise against anyway), you should rather rather opt for a porro prism design. For more: Cheap Binoculars – Is a Roof or Porro Prism Best? The amount of eye-relief the binocular has will be very important to those who use glasses and want to keep them on whilst watching cricket through their binoculars. Eye Relief is basically the distance from the ocular lenses or the last surface of an eyepiece at which the eye can obtain the full field of view. Eyecups on the binoculars ensure that your eyes will be at the correct distance for this to happen, but if you wear glasses, you can't get your eyes as close to the lenses as those without glasses, so you need to adjust the eyecups to ensure that even with your glasses on your eyes are the correct distance from the ocular lenses. Binoculars with a longer eye relief are ideal for those who wear glasses as they basically project the image further beyond the ocular lens, giving you plenty of room to play with. So if you wear glasses, you should be looking for an eye relief of at least 15mm, to see the full image full image. The down side to long eye relief is that it usually reduces the field of view. Or you can take a look at All Binoculars ideal for Sporting Events, including Cricket that I have so far reviewed.